This healthy quinoa salad recipe was a delicious last minute creation that I threw together after a haphazard inventory of my pantry. I had fresh spinach and wanted to use it for something other than green smoothies. 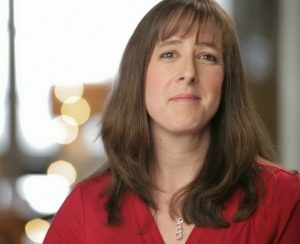 I had a container of quinoa so I headed to Pinterest to find some quinoa salad recipes. Since I didn’t have any of the other ingredients most of them asked for, I decided a little improvisation was needed. Lo and behold, a new salad recipe has been added to my monthly menu rotation! This healthy quinoa salad recipe is completely flexible, based on the contents of your own pantry and fridge. Choose a dark green, leafy veggie. Kale, spinach and swiss chard are good choices. Then, choose a dried fruit. Or a fresh fruit. 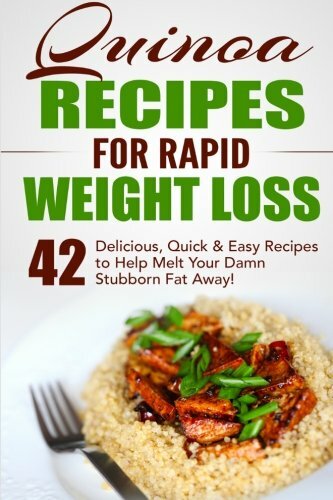 Some examples are chopped apples, raisins, dried cranberries, fresh cherries, etc. Add any nut you want but slivered almonds, chopped pecans, or walnuts would all work fine for this recipe. 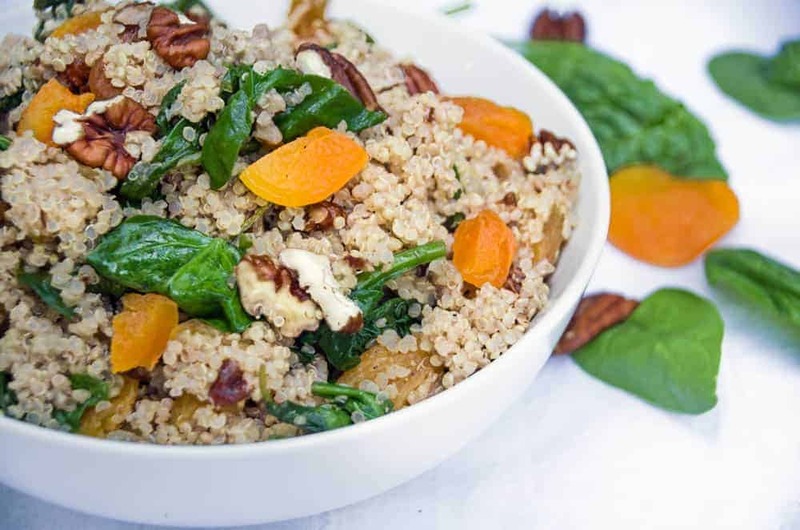 Now you have a dozen variations of this incredibly healthy and EASY quinoa salad recipe! 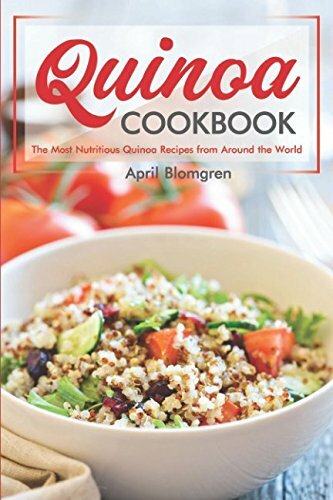 Check out my post about cooking with quinoa and pick some up next time you are at the grocery store. 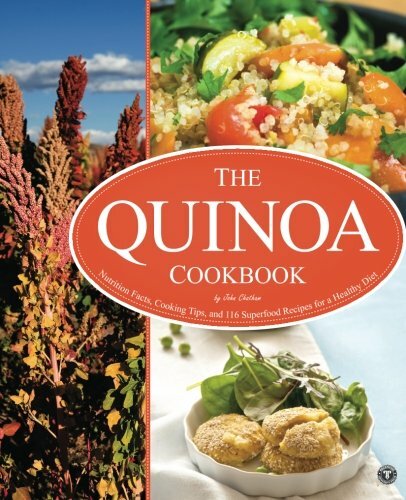 It seems like most major grocery stores sell quinoa now but if your selection is limited, then shop on Amazon. They have a great selection of red, white, black and multicolored quinoa available. Buy organic quinoa if possible. If you have left over quinoa, you can make my Asian Quinoa Recipe with Broccoli and Tofu. It can also be used for breakfast recipes or a healthy side dish . 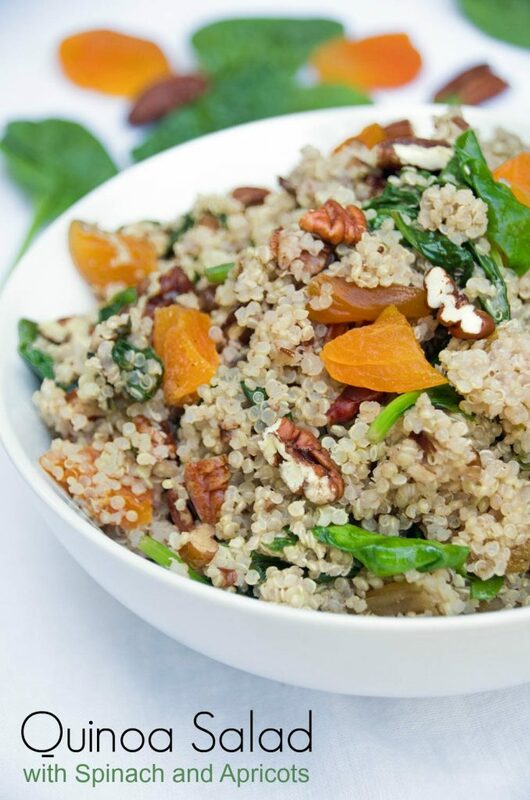 A healthy quinoa salad recipe loaded with fresh spinach and dried apricots. Rinse and cook quinoa according to package directions. Use 1 cup quinoa to 2 cups veggie stock. Reserve the remaining 1/2 cup veggie stock for later. Add garlic and saute for 2 to 3 minutes or until fragrant. Add the fresh spinach, juice of 1/2 a lemon, and the remaining 1/2 cup stock. Put lid over the pan and cook until the spinach is wilted. Add the nuts and dried apricots and stir 2 to 3 minutes. Add in the cooked quinoa and season with salt and pepper. Like this healthy quinoa salad recipe? Pin it for later!